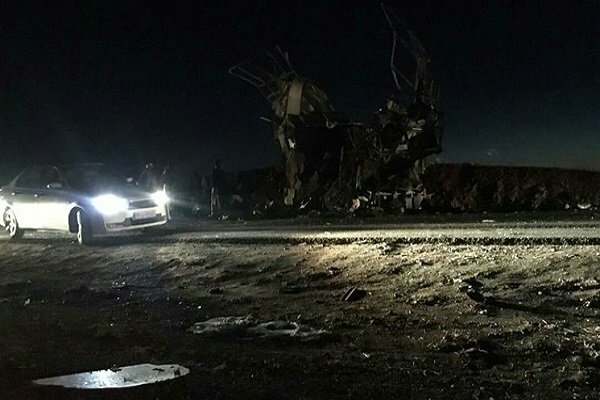 Tehran: At least 27 Islamic Revolution Guards Corps (IRGC) forces were killed and 13 others injured in a terrorist attack when they were traveling between the cities of Zahedan and Khash, in Sistan and Baluchestan province on Wednesday and their bus was targeted in a suicide car bomb attack. The Jaish ul-Adl terrorist group reportedly claimed responsibility for the bombing. Meanwhile Iranian Foreign Minister Mohammad Javad Zarif says it is not coincidental that terrorists have attacked the Islamic Revolution Guards Corps (IRGC) on the same day that an anti-Iran summit organized by the United States kicks off in Poland. Condemning the suicide car bombing attack against an IRGC personnel bus, Zarif raised suspicion about the deadly attack’s possible links to the “circus” in Warsaw, the Polish capital.